​Female belted kingfishers (left and centre) are distinguished from the male by the rusty red belly band. Both have a breast band. Photos by Mike Yip (left) and Kim Wetten with the VIU Bird Banding Project (centre and right). 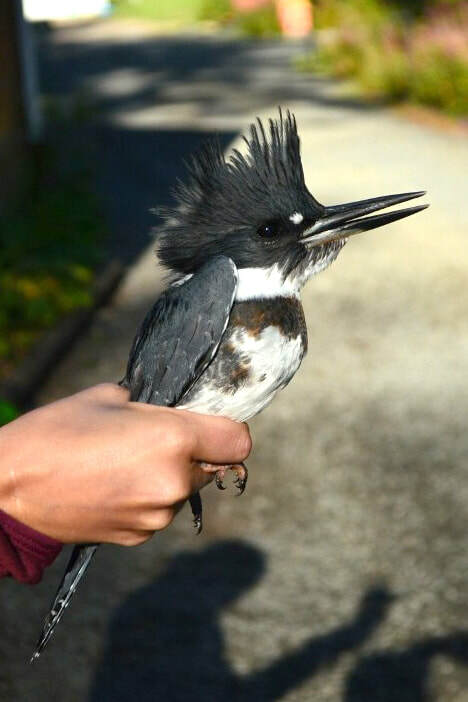 Between its stocky, top-heavy build, its large head, its shaggy crest, and its long and thick pointed bill, the belted kingfisher is hard to misidentify. It is pale blue above and white below with a bluish (sometimes coppery) band across the breast. The female also has a rusty red belly band that extends down her flanks. This bird has a rattling call, which may be broken up by a high-pitched "screaming" call. Click here to listen. 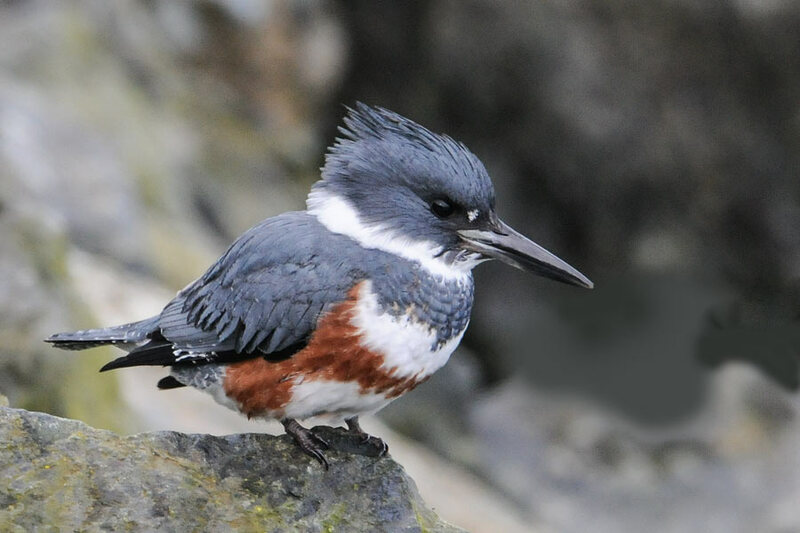 The belted kingfisher can be commonly spotted around streams, rivers, shorelines, estuaries, and other waterbodies with clear water where it can fish. It may perch, hover, or dart to and fro before plunging headfirst into the water after its prey. It nests on steep sandy banks. It is found throughout most of North America at some point during the year: its summer breeding range extends across much of Canada, its winter range extends across Central America, and it can be found year-round in the area in between. It is found year-round on the Central Coast, as well as south to California and north to southern Alaska. 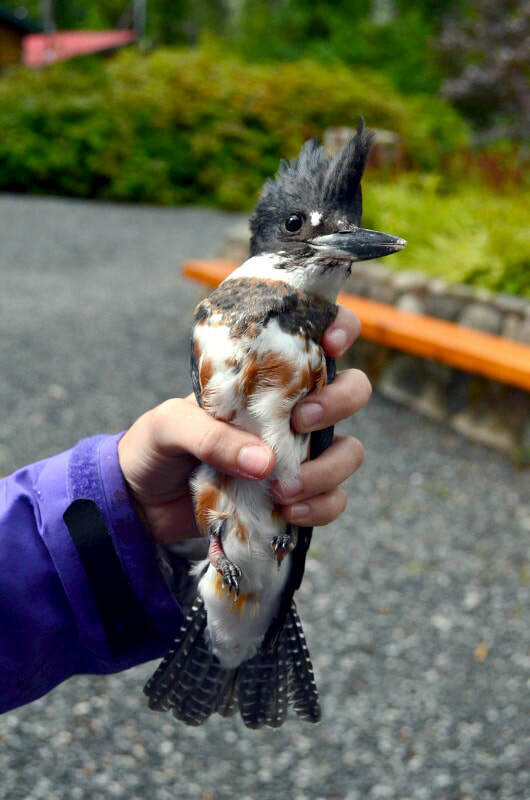 Belted Kingfisher ​Megaceryle alcyon. Audubon Birds. National Audubon Society. Accessed 10/03/2016. 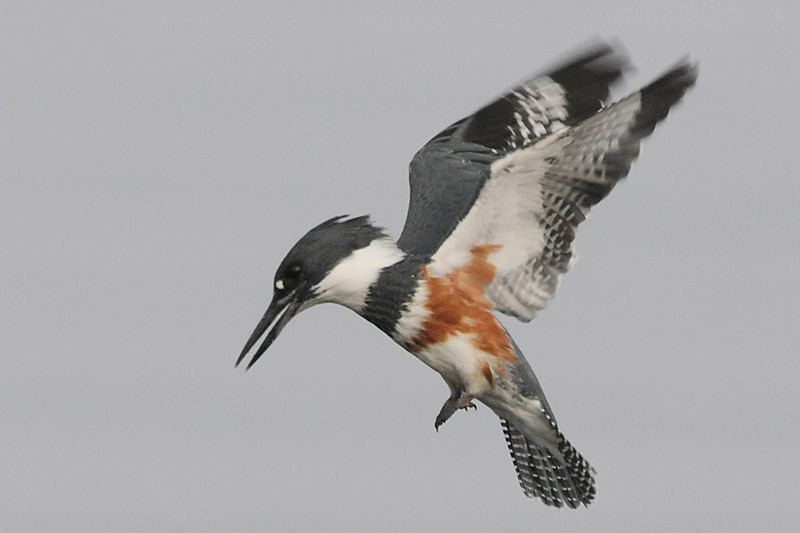 Belted Kingfisher Megaceryle alcyon. The Birds of North America Online (A. Poole, Ed.). Ithaca: Cornell Lab of Ornithology. Retrieved from the Birds of North America Online. Accessed 10/03/2016. Dunn, J. L. and Alderfer, J. (Eds.). (1999). National Geographic Field Guide to the Birds of North America. (3rd Ed.). Washington, D.C.: National Geographic Society. Pp. ​310-311.